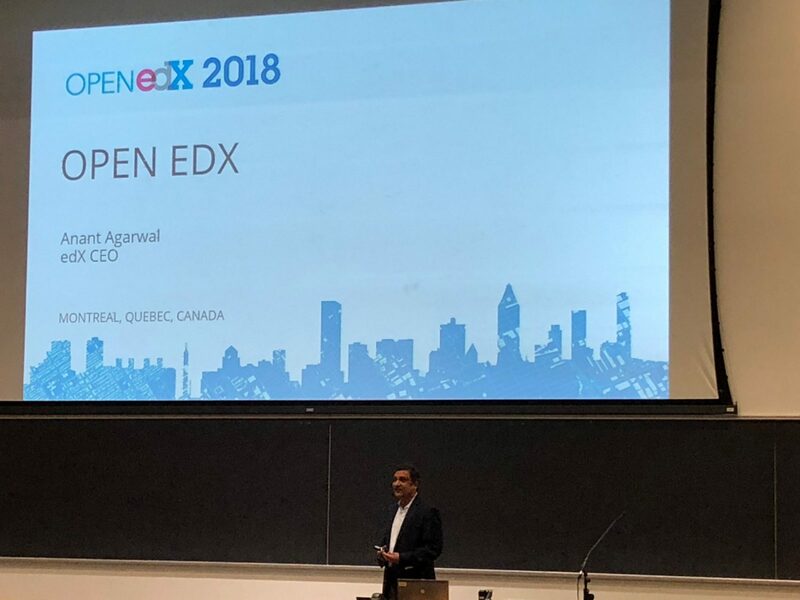 On Wednesday, edX CEO Anant Agarwal took the stage at the University of Montreal to kick off the Open edX 2018 conference. Following the model of the United Nations, he laid out what he called Reimagine Education Goals, which he hopes to accomplish by 2022. For the most ambitious, Agarwal hopes to attract 100 million learners to edX in five years’ time. The non-profit MOOC provider has, one might argue, remained truest to the original promise of MOOCs (keeping them open and massive) when they exploded in 2011 and 2012. The platform has trained 16 million learners with courses from over 130 different institutions. Using the Open edX platform, a further 18 million + have taken at least one university course, bringing the total number to roughly 35 million. According to Agarwal, acquisition of new learners at edX and use of the Open edX platform has reached an exponential growth. But the global appetite for MOOCs indicates that growth might be leveling off. In 2017, 23 million learners signed up for their first MOOC, according to Class Central. That number was the same in 2016. Total MOOC users currently sits at around 81 million. Sure, five years is a long ways away, but it’s going to be a stretch for edX to reach Agarwal’s mark. That statement summed up Agarwal’s second goal. He wants his company to incorporate AI-powered adaptive learning into the mix. That would entail an algorithm that tracks student progress and matches them with the educational material that can help them succeed in a given class, MicroMasters, or specialization. For another use of digital technology, Argawal wants to incorporate AR and VR into edX courses. VR has already gained broad popularity in fields such as medicine where students can explore virtual human bodies before they encounter real world scenarios and in addition to cadaver work. Lab components in numerous science subjects could benefit from this. In addition to a few other goals, Argawal wants to foster a culture in which university credits are more transferable and widely accepted. “Why is it so hard to do?” he asked. He hopes to generate a community in which 25% of edX courses will count anywhere. “Let’s say I want to launch an online masters degree in computer science and I want to teach AI as part of it,” Argawal said. “And U de M and Polytechnique, they have one of the top deep learning programs in the world. Imagine if you could collaborate where they create a MicroMasters in AI, I create a MicroMasters in architecture or systems, and someone else does one in software engineering. Imagine if you could combine that and, when a student completes a MicroMasters from A, from B, and C, they could combine that to form an online degree. There’s possibly no better example of siloing in education than the walls that learners run into when they try to incorporate elements into their education from different educators and institutions. Of course, there are issues with this in regard to differing standards and accreditation guidelines throughout the world. Students often run into problems when seeking to transfer credit from an internationally or nationally accredited institution to a regionally accredited analog. “Our code is open source, we’re committed to open standards,” said CPO Mark Haseltine. “We would like to see interchangeable credentials in general. There’s no standard for credentialing.” And that’s where edX sees room for growth.